The poor launch numbers for Tony Hawk's latest skateboarding title are all part of Activision's grand plan for the Holiday season. Yesterday, we reported that Tony Hawk Shred sold a dismal 3,000 copies. With Activision raking in the dough from Blops, it can certainly absorb a few duds, but as Funk pointed out, 3,000 copies is just embarrassing. But Eric Hirshberg, CEO of Activision Publishing, seems to think that the best days of Shred are yet to come. The skateboarding title, according to Hirshberg, was specifically targeted at children and kids get gifts during the holidays. Therfore, he expects that sales will rebound in December. A little help from a talk-show host doesn't hurt either. "There's hopefully a method to that madness," Hirshberg said. "For the first time we're targeting that game to kids. It's a gift-oriented game, but, that said, we need to build awareness for the game still. ... I think you'll hopefully see a bigger ramp-up as we get further into the gift giving season." He also points to the fact that "The Ellen DeGeneres Show" picked Shred as one of the 12 top gifts to give to children this year. We were discussing the abysmal performance of Shred in the office yesterday. It's true that games like Tony Hawk 3 and even the more recent Underground were great, but I think that Activision may have flooded the market like they did with the plethora of Hero music games. 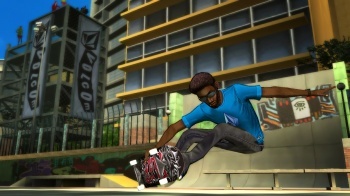 Skateboarding was also much more popular ten years ago, and the sport doesn't engender the same kind of devoted fandom that can support annual updates to other sports games like Madden. Can you name five professional skateboarders? Can you name another one besides Tony Hawk? Me neither. Maybe Activision should retire the skateboarding genre until the inevitable resurgence of the sport's popularity in 2021. You heard it here first, people, skateboarding is dead. At least until it becomes retro hip in the next decade.